The University of Toronto’s Digital Verification Team, now in its third year and housed in the International Human Rights Program, is part of Amnesty International’s Digital Verification Corps (DVC) and assists Amnesty International’s human rights research efforts by reviewing and verifying numerous hours of footage and raw digital content relating to alleged human rights violations around the world. Verified pictures and videos can serve as concrete pieces of visual evidence linking human rights violations to certain times, places and events and can help bolster Amnesty International’s case against perpetrators of human rights violations. This year, in connection with the Rohingya crisis in Myanmar, hundreds of videos and pictures of burning villages and fleeing communities were posted on social media platforms. If this content can be verified, it can help determine exactly when and where the violence against the Rohingyas took place, ultimately making it harder for the perpetrators to deny or ignore their crimes. Verifying this digital content and making that determination is the work of Amnesty International’s DVC. By relying on several different indicators of reliability, including external pieces of information that speak to the date and time of the event and the credibility of the uploader, the DVC can verify digital content, and with some precision, identify the date and place at which these events in question occurred. In collaboration with several other DVC groups, the University of Toronto’s DVC Team was able to review and verify the digital content posted from Myanmar during the Rohingya crisis. In addition, the University of Toronto’s DVC Team reviewed content from violent clashes in Iraq, state suppression of protests in Russia, and ongoing incidents in the Syrian conflict. In addition, the DVC Team monitored several social media platforms for potential human rights violations related to the recent elections in Kenya and online abuse targeted at certain prominent women. In June 2018, the Faculty of Law provided funding for four students from the University of Toronto’s DVC working group (Alexandria Matic, Bethanie Pascutto, Ben Mayer-Goodman and Karishma Prasanna) to travel to the second annual DVC Summit at the University of Cambridge. They were joined by students from the University of Berkeley, the University of Essex, the University of Pretoria and, for the first time, students from the University of Cambridge and the University of Hong Kong. 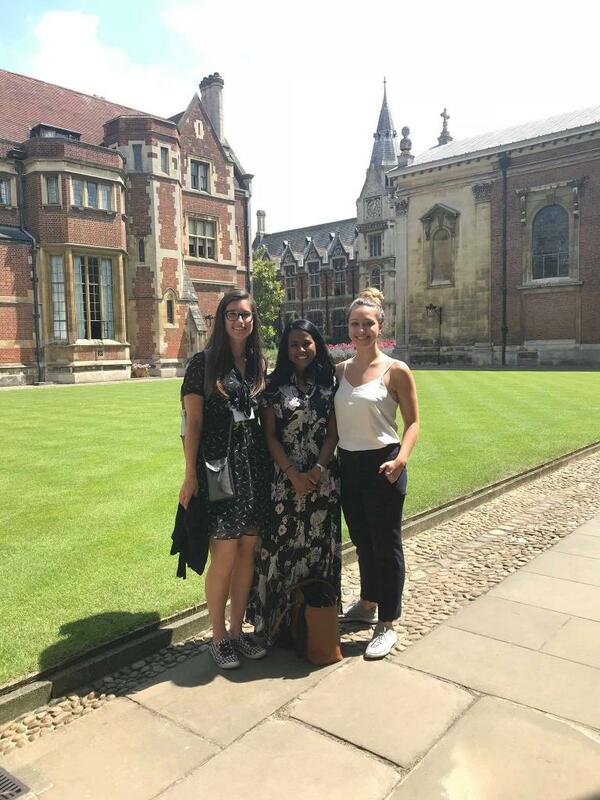 Bethanie Pascutto, Karishma Prasanna and Alex Matic, in Pembroke College, Cambridge, in June 2018. Credit: Summit attendee. At the conference, DVC groups shared past projects and discussed how to best coordinate and collaborate in future endeavors. Over the past few years, several schools have worked together to verify large volumes of content. DVC summit attendees agreed that collaboration of this kind was essential, but that it was also necessary to increase lines of communication between all schools in order to streamline project work and increase efficiency. In addition, given the often violent and distressing imagery of human rights violations that DVC participants work with, summit attendees also discussed the negative psychological implications of viewing some of this imagery and shared some self-care tips on how to recover after working with such content. Over the course of the summit, attendees also heard from several experts in the field of open source investigation, digital verification and human rights law. A number of speakers discussed their work with information credibility and reliability. Connie Moon Sehat, a lead researcher for the Credibility Coalition, spoke about efforts to establish a scientific and systematic way to assess credibility. The Credibility Coalition is an organization dedicated to developing a set of open standards to assess the reliability and credibility of information found online and in the news. In a similar vein, Hazel Baker, the Global Head of Social Media Newsgathering at Reuters News Agency, spoke to the importance of information credibility in the field of news gathering and how the changing reality of news requires major news institutions to have social media teams who are equipped to assess credibility of information. Hazel often receives photos and videos from civilians at the scene of a particular news event, and in order for Reuters to use the digital content, the content must go through a process of verification. Patrick Worral, who runs the FactCheck blog at Channel 4 News, also gave the attendees an inside look into how a newsroom operates and how news establishments make the call on what digital content is deemed credible and included in the news cycle. The DVC’s work has real world impact. Amnesty International researchers took the time to share with summit attendees the impact digital verification work has on Amnesty International research. Pictures or videos found on social media platforms that can be verified give Amnesty International real time information on what is taking place on the ground. This verification becomes even more valuable in areas where Amnesty International is denied physical access to the location, because Amnesty International no longer has to wait until the crisis is over to look back and evaluate the outcome. Verified content also arms Amnesty International with concrete visual evidence of potential human rights violations and this increases the accountability of local governments and ultimately changes the way Amnesty International interacts with these parties. Donatella Rovera, a senior crisis response adviser at Amnesty International, explained how verifying just one photo or video of an event can positively impact her work in the field by helping to identify locations and timelines. In particular, she discussed how open source investigations assisted in Amnesty’s investigation of the latest airstrikes in Raqqa, Iraq. She also highlighted how crucial verification can be to her work in locations where the local government does not allow journalistic or humanitarian aid access. Niko Para, a lead developer at Syrian Archive, also spoke to the importance of past and future DVC work with respect to the Syrian Archive. The IHRP DVC group has been involved with the Syrian Archive for the past two years by assisting with the verification of thousands of hours of footage of potential human rights violations captured during the Syrian conflict. With the inclusion of two more schools at this year’s summit, the University of Cambridge and the University of Hong Kong, the DVC continues to grow, and the work of DVC groups is becoming increasingly valuable. Given the speed at which information travels and the potential impact a single image or video can have on the way Amnesty International conducts its human rights violations research, digital verification continues to be an important and necessary skill. The University of Toronto Digital Verification Group looks forward to continuing to help Amnesty International’s crucial research efforts in this regard. The IHRP DVC group worked with Amnesty International to document and assess human rights abuses in Rakhine State, Myanmar. The IHRP DVC group worked with Amnesty International’s researchers to corroborate allegations of state violence against the vulnerable Rohingya project, culminating in Amnesty International’s June 2018 report “We Will Destroy Everything”: Crimes against Humanity in Rakhine State. Using videos taken by Rohingya refugees, members of U of T’s DVC working group identified the points at which refugees departed Myanmar and entered neighbouring Bangladesh. With the help of satellite imagery, the DVC was able to identify and corroborate the location of incinerated villages in Rakhine State. By working with Amnesty International’s on-the-ground researchers and contacts, the DVC is helping to hold Myanmar authorities internationally and publicly accountable for their human rights violations.